SOCHI, Russia (AP) Once a critic of Neymar’s antics, Brazil coach Tite now defends the demeanor of his team’s star. Neymar had been accused of faking an injury in the game, and video of Tite’s criticism was widely viewed. 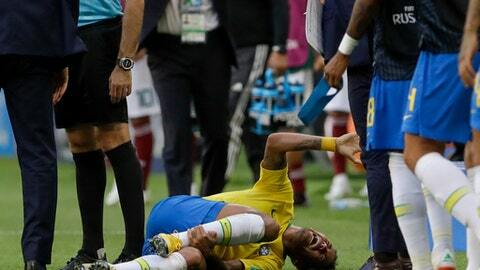 Mexico coach Juan Carlos Osorio criticized Neymar – without mentioning his name – after the striker writhed in apparent agony after Miguel Layun stepped on an ankle, then quickly recovered as if no incident had occurred during the 2-0, round-of-16 win over El Tri. Neymar was asked to respond to Osorio, but Tite intervened before Neymar could start talking during the news conference. Tite said hierarchy must be respected in soccer. He said only coaches would answer to coaches, and players would respond only to players. Neymar was being defended by many in Brazil, especially because he has been playing well and is helping the team succeed at the World Cup, but he continued to be loudly criticized internationally for his antics. The 26-year-old Paris Saint-Germain forward said some people were trying to gain attention by going after him. Others were attempting to undermine him, he said. Tite hadn’t been the first manager to criticize Neymar in Brazil. Rene Simoes, who coached many of Brazil’s clubs and led Brazil’s women’s national team to a silver medal in the 2004 Olympics, didn’t save words after a very young Neymar went crazy on the field for not being allowed to take a penalty kick for Santos in 2010, disrespecting teammates and his coach.